Junk Wax deals in baseball cards from the late 1970s through early 1990s, with a focus on single cards and unopened packs for the set building enthusiast. 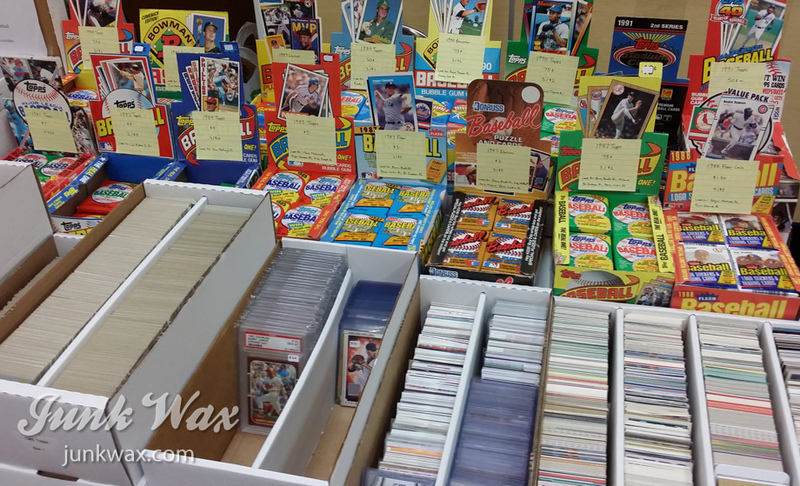 The majority of our inventory consists of Topps commons (mostly 1979-1990)and wax packs (1981-1992), although we do carry cards from other brands including Donruss, Fleer, and Upper Deck. Located in Cincinnati, Ohio, we sell exclusively at sports card shows, particularly the monthly shows at the Sharonville Clarion Inn. To confirm whether we will be at a particular show, please email us in advance at cards@junkwax.com. We also have a limited selection of complete sets, autographs, and cards featuring current and recent Reds players. Although we don't sell online and we don't bring our entire inventory to every show, we are happy to fill want lists and have your cards ready for pickup at our next show. Just email us and we can let you know if we have the cards you're looking for. Inventory and pricing subject to change without notice. Please email for pricing. Unless otherwise indicated, sets are unsealed and/or hand collated. © 2019 Junk Wax, LLC. All rights reserved.